I flew my first solo flight today! At first I wondered, “Is this really such a big deal?” Before today, the upcoming solo flight just didn’t feel like it would be extraordinary. One of the things I like about flying is that it’s not stressful, difficult, or onerous — I feel well prepared for each flight (a combination of the flying lessons, ground instruction, and my instructor’s preflight briefing) meaning that I feel comfortable with my decisions aloft and confident in my ability each time I emplane. So I figured today would simply feel like another fun day of flying. But when the time came, it was a big deal. As I taxied N3509Q (“zero niner kaybeck” on radio calls) away from the hanger door, away from my instructor standing in the door waving, a wave of emotions surged through me and my heart started racing. It was exciting! It was thrilling! I felt the pride of accomplishment, especially since it reflects my efforts for the first three-and-a-half months of lessons. It was very strange being alone in a moving cockpit! I wasn’t scared, but I knew I’d feel like a chump if I landed in the Merrimack River or pulled a ground loop or crushed the nosewheel and firewall or basically anything that would result in a timid call to the insurance company, so I wanted to avoid those outcomes. In addition to it being strange being alone in the cockpit, it was also strange how the airplane handled without the extra weight of my 240 pound instructor — in short, the plane went up faster and down more slowly. It was a beautiful day to fly: clear visibility, light winds, high pressure. My instructor prefers to have his students fly their first solo flight at Lawrence Municipal Airport (LWM), about 10 minutes northeast of Hanscom Field, to avoid the usual heavy weekend traffic flying the pattern at Hanscom. (For later solo flights we’ll stay at Hanscom to practice solo flight under more hectic circumstances.) So I pulled the Boston terminal area chart and LWM airport diagram out of my flight bag and flew us up to Lawrence at 2,500 feet. One of the amazing things about flying is just how quickly you can get from point A to point B when you’re flying at 120 MPH in a straight line — the 45-minute drive from BED to LWM takes 10 minutes by air. Of course, those 10 minutes don’t include the time to plan the flight, or to perform the preflight inspection, or to taxi from the parking ramp to the runway and test (runup) the engine, or the hours of delay you might have to wait to take off if the weather is uncooperative. The first three solo flight lessons at my school are “supervised solos”: 3 or more touch-and-go landings with an instructor, then 3 landings solo. 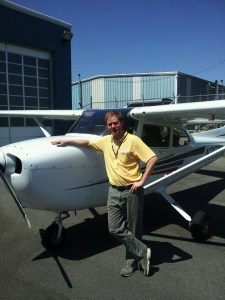 The goal of these mixed dual/solo lessons are to bolster the student’s confidence (“I was just able to land with my instructor, so I should be able to land fine without my instructor”). After taking these three supervised-solo flights I’ll be able to take a plane out anytime I want in order to practice landings at Hanscom, and later to practice maneuvers in the practice area. The first one was a little flat. During the pre-touchdown flare you’re supposed to pitch back more and more (lifting the nosewheel higher in the air relative to the main wheels) before the mains touch the ground. I didn’t pitch back far enough on this landing. It wasn’t a bad landing — just not a textbook landing — and importantly I didn’t strike the nosewheel first, which would have been very bad. The second one was a little fast. When you cross the runway threshold in the Cessna 172 you should be flying about 65-70 knots. I was probably going 75-80 knots on this landing, so I floated down the runway for a while, bleeding off speed, until the wheels finally sank down. The third one was a little high. As I was taking off for the third circuit the tower asked me to fly a right pattern because there was a banner-tow plane circling to the west of the runway. While making the right turns I misjudged the base turn and turned too early, meaning I still hadn’t descended enough by the time I had to turn final. At that point I had several options: I could panic, or I could execute a go-around, or I could execute a forward slip, or I could add more flaps in an effort to go down and slow down. Since KLWM runway 5 is 5,001 feet long I decided to add flaps since I had plenty of distance to burn off the extra height. So, on average, my first three solo landings were perfect. And as my instructor points out, the real skill to landing is recognizing and correcting minor problems in order to prevent them from becoming major problems. Despite flying flat, fast, and high, I felt both in control and comfortable at all times. I truly enjoyed the experience of flying solo. It was a big deal! Each time I fly I find myself looking forward even more to the next flight. What often strikes me most is just how beautiful the landscape looks just after takeoff — suddenly you can see for miles in every direction, and there’s just so much to see that you find yourself metaphorically gasping to take it all in. And today, flying in the traffic pattern at 1,000 feet over the gorgeous buildings of the City of Lawrence, Massachusetts, with the town surrounding me like an impossibly exact hobbyist’s scale model, made for the perfect visual accompaniment to an already beautiful day. After a few more solo flights we’ll start working on cross-country flight (“cross country” means greater than 50 miles), leading up to two supervised-solo cross-country flights then two solo cross-country flights. We’ll then do some night flying, some more flight by reference to instruments, and I’ll practice the ground reference maneuvers, and pretty soon I’ll be ready to take the final knowledge and practical tests. Of course, “pretty soon” is relative — I’d logged 22 hours of flight time before soloing, and I can expect to log 50 to 60 hours total by the time I take the certification tests.